Carry your essentials in handsome style with the Murray Hill Messenger. Messenger bag made of soft full-grain leather. Detachable shoulder strap with logo-embossed leather pad. Top flap with front buckle closures. Cotton-lined interior features a zip pocket and two slip pockets. Imported. Measurements: Bottom Width: 16 in Middle Width: 16 in Top Width: 16 in Depth: 4 in Height: 12 in Strap Length: 52 in Strap Drop: 25 in Weight: 2 lbs 4 oz This product may have a manufacturer's warranty. Please visit the manufacturer's website or contact us at warranty@support.zappos.com for full manufacturer warranty details. 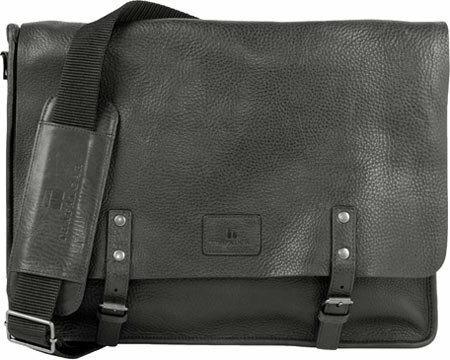 The Murray Hill Messenger Bag from Trafalgar is a flapover shoulder briefcase with a full grain leather exterior. Detachable and adjustable shoulder strap is comfortable and convenient to use. Front flap single compartment has 3 interior wall pockets, key fob, and hidden pocket. Plenty of accessory pockets to go around for your daily needs.